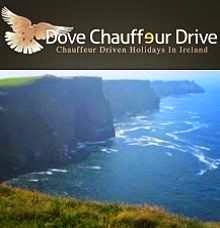 HOLIDAYS in IRELAND: Chauffeurdriven tour with Dave Hogan and Dovechauffeurdrive and tha Walsh family. Chauffeurdriven tour with Dave Hogan and Dovechauffeurdrive and tha Walsh family. Today we left Ashford castle behind,after a really special stay at the Ashford Lodge. My pals really loved this place, and Mike even managed to do a spot of fishing before breakfast, but unfortunately the fish were not biting. The lovely Christie, relaxing with John Wayne and Maureen O'Hara, the bronze, which was erected to honour the main stars in the movie. This is Pat Cohan's Pub, which also featured in the Quiet Man, and is located in the square in Cong. Our lunch break came in the seaside town of Spiddal, where we had really nice food in a warm friendly atmosphere.Mike had a really good steak sandwich, and Brianna had the chicken and chips (our kind of chips). Christie and i had the chowder, while Bill and Edie had sandwiches. This evening was Banquet time in this ancient medieval castle in Kinvara, known as Dun Guaire, the fort of a ruler by the name of Guaire. Here are my happy group, all set to enter the old castle for their medieval banquet. Two lovely ladies, Edie and Christie, adding a bit of glamour to this special event.